One situation where the steady-state accelerator can be applied is to simulations containing hydraulic jumps. In this blog, with the help of a case study contributed by Dr. C.W. “Tony” Hirt, I will discuss the performance gains obtained by using the steady-state accelerator. The establishment of a hydraulic jump at a fixed location is an interesting case for studying the effects of the steady-state accelerator on simulation runtimes. On the one hand, it is desirable for the accelerator to reduce the computational time for setting up the jump from initial conditions that have no jump. On the other hand, a hydraulic jump is not a steady flow phenomenon. At a jump, there is a change in mean flow speed and in the depth of flow. This transition must on average conserve mass and momentum, but the average kinetic energy across a jump decreases. The transition is accompanied by fluctuating kinetic energy vortices, where the kinetic energy is eventually converted by viscous action into heat. Figure 1a shows a simulation of a hydraulic jump that has formed downstream of a gate due to a sudden change in the depth of the channel. The plot corresponds to the conditions that have reached an average steady state (25s after the start of the flow). A closeup of the jump in Fig. 1b illustrates the kinetic energy vortices. The downstream fluid height is 0.574m, while the upstream height is 0.2m. The toe of the jump is not stationary and bounces around with time. A corresponding simulation (Figs. 1c-1d) using a steady-state accelerator coefficient of ssacc=1.0 shows less movement of the toe of the jump, and the fluid surface behind the gate is no longer sloshing. Figure 1a. Hydraulic jump at step colored by turbulent kinetic energy density. Figure 1c. Hydraulic jump colored by turbulent kinetic energy density, using ssacc=1.0. Figure 1b. Close up of the jump, showing eddy structures. Figure 1d. Closeup of the jump, using ssacc=1.0. 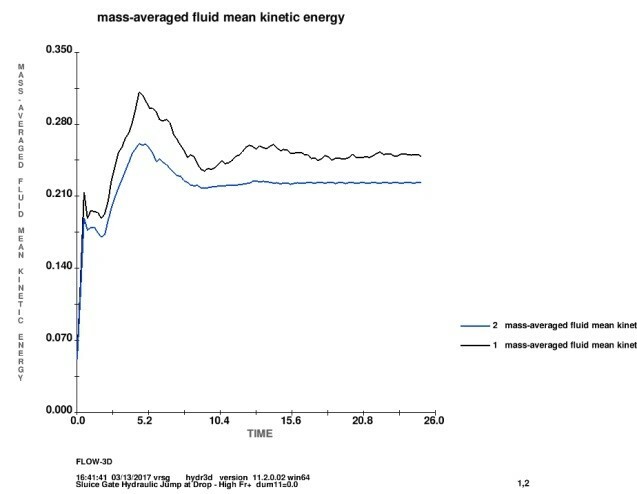 Figures 1e-1g show a comparison between the histories of the fluid volume, the average mean flow kinetic energy and the average turbulent kinetic energy (RNG turbulence model) for the two simulations. In all quantities, the steady-state accelerator provides smoother histories with smaller extreme excursions. The damped simulation has for all practical purposes reached an average steady state by about 15s of simulation time, whereas the un-damped simulation is still showing some low-frequency variations after 25s. The damped results are not perfectly steady, but they are nearly so; an expected result, due to the unsteady nature of a hydraulic jump. The damping mechanism is not intended to completely smooth out all variations, because it is important to allow simulations to evolve to realistic flow states. Figure 1e. 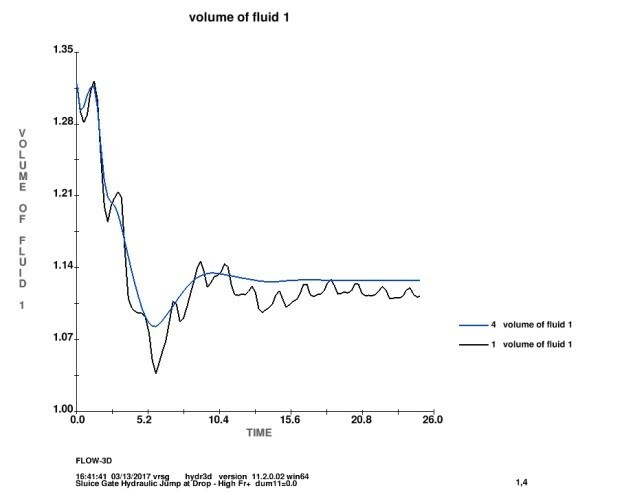 Fluid volume history. Smoother (blue) line is with ssac. Figure 1f. Average kinetic energy history. Lower (blue) line is with ssac. Figure 1g. 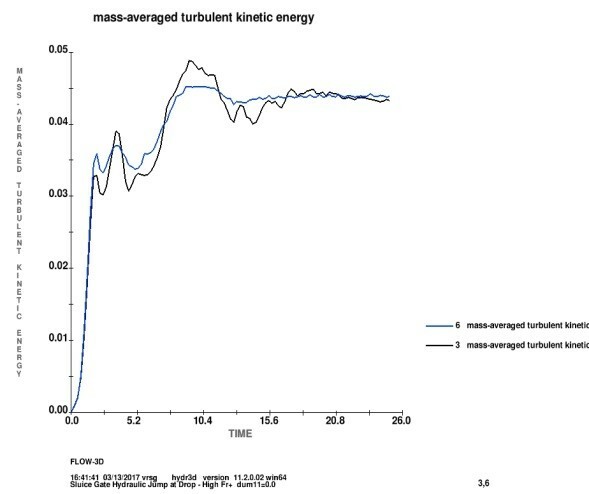 Average turbulent kinetic energy. Smoother (blue) line is with ssac. With the steady-state accelerator, we now have a mechanism in FLOW-3D that reduces simulation times to reach a steady state for free surface problems. This is especially useful in water and environmental applications, allowing users shorter runtimes without sacrificing accuracy. * The VOF method tries to calculate a steady state as the asymptotic state of a transient flow. A steady-state solver, on the other hand, drives the normal surface velocity to zero while maintaining the incompressibility of the flow. The coefficient ssac (steady-state accelerator coefficient, 0 ≤ ssac ≤1) is used to control the surface wave damping mechanism.